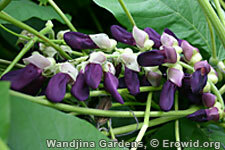 Mucuna pruriens is a tropical vine growing from 3-18 meters with white to dark purple hanging flowers. It's bean-like pods are covered with long stinging hairs and contain black, white, or tan seeds. The leaves, seeds, stems and roots contain L-Dopa, Serotonin, 5-HTP, and Nicotine, as well as N,N-DMT, Bufotenin, and 5-MeO-DMT. It has a tradition of use as a Ayurvedic aphrodesiac, treatment for parkinsons, ayahuasca admixture, and coffee substitute.